I don´t think any CEO (or, for that matter, any layperson) would disagree with me if I said that being trusted is a powerful asset for a business. It makes sense that if you are in business, you would want your customers, employees, shareholders, the regulators, the man on the street and media to trust you, rather than the other way around. We can relate to trust because we exercise it all the time in our everyday lives. Think about our willingness to pay more for organic vegetables because we believe these specially grown produce are better for our health. And in my case, my faith in the UK retailer Marks & Spencer when I was a trainee accountant in London many years ago, on their promise of no-questions-asked refunds for returned goods. But when it comes to their own organizations, many business leaders struggle to place a value on being trusted. They might think that it’s a good-to-have, but practically impossible to measure. They most likely agree that trust is important but perhaps not urgent, especially in a time of severe cost pressures, talent woes and depressed market conditions. I firmly believe that trust can be a tangible asset for a business, one that can grow the bottom line and which will see you through the difficult times. So what if I were to say that there is a way to measure trust – and that it does bring quantifiable and long-term financial benefit to your business? 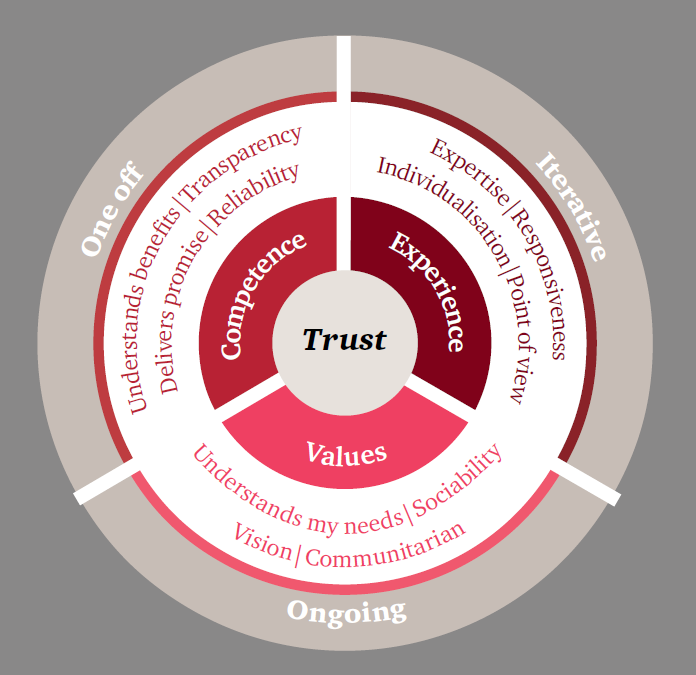 Over the past few years, PwC has conducted research, run focus groups and talked to both leading experts as well as the everyday person on the topic of trust. Our question was: what makes up trust in a business – and can it be quantified? · Competence – Does the organization do what it says it will? People expect companies to be reliable and transparent. A fast-food company should be upfront about the possibility their delivery will be delayed, for example. In cases of major delay, companies should be forthright about not even accepting the customer’s order. Fast food is supposed to be “fast”, after all. · Experience – Does the organization keep its promises? · Values – Do you believe in the organization? People want brands to understand their needs, to hold the right sort of principles and to care about their impact on society. Clothing retailers that source their cotton from fair trade suppliers are increasingly in demand because they are not seen to be exploiting cheap labour and because their products will benefit small-scale agricultural workers. Many of us can immediately call to mind the damage that happens to your brand when you lose trust – think of a recent vehicle emissions scandal as one example. But what of the opposite? What’s the positive financial impact of having existing trust with customers, employees, investors? The first is customer loyalty. To quote the World Economic Forum’s Leadership, Trust and Performance Equation Project, trust drives 22% to 44% of overall customer loyalty. Research shows that organisations with loyal customers are twice as likely to exceed the forecasts of financial analysts. Then there are your employees, often your most prized asset. In Fortune’s 100 Best Places to Work study, they found that top-ranked companies who were better trusted by their people, experience up to 50% less staff turnover than their competitors. Looking at the results over the past 10 years, higher trust scores and profits are actually correlated. In the face of all this evidence, you many wonder what (if anything) businesses and their people can do about their level of trustworthiness. Is it possible to purposefully and methodically build your reservoir of trust with the stakeholders that matter to you? The answer is of course a yes. And I don’t think it has to be complicated. Because trust is an age-old concept, one that is at the root of any successful relationship. Often, I’ve found that the steps to create trust can be simple, and are the same whether applied in our personal or professional lives. First, we have to behave in a trustworthy manner, consistently; second, we need to hear (and not just say that we “listen” to) our stakeholders; third, we should be clear about the sorts of values our organisation espouses. Yet, many leaders may struggle with keeping this consistent across their organisations, and perhaps that’s because trust building hasn’t yet been part of their business agenda. My parting point is this. Beyond the fact that being trusted or trustworthy can bring your business immeasurable benefit, there is a more ethereal reason at stake here – where matters of the heart come into play. Think of the numerous tales that have gone viral of good Samaritans on the road, strangers helping stranded fellow road users change their tyres While these are simple acts, today we are so used to being cautioned against road rage and carjacking, that hearing there are still people who only mean well, is heart-warming to say the least. These stories resonate with all of us. The fact is in today’s climate there seems to be a real lack of faith in institutions - all over the world and closer to home in Malaysia. Yet, there is a deep desire in all of us to be able to put our faith in something. So why can’t businesses be that something? My challenge then to corporate leaders and those in business really is to bet our bottom dollar on trust-building, because it does make a difference. In my books, at the end of the day, it’s the only thing that does matter. HGSCA is pleased to announce the appointment of Soledad Tanner as its new Vice President. This is the first of several new key appointments to the organization’s leadership team. project management execution to name a few, will play a key role for us as we prepare for the launch of new important projects that will benefit our communities." Ms. Tanner succeeded former President in charge and Vice-President, Mr. Ernesto Cedeno, who was appointed as the new Vice President of HGSCA chapter Guayaquil in November 2016. Mr.Cedeño departed to Guayaquil last November after taking the oath of office as the new Vice-President for Guayaquil.